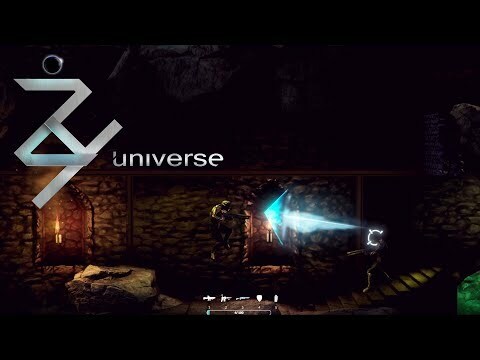 Zy Universe is a 2.5D arena shooter set on-board the USS Sovereignty – humanity’s last hope for survival. While exploring the unknown of a new sci-fi universe, you will find yourself immersed in a futuristic hand crafted world. With an air of retro nostalgia offered by the side scrolling perspective, you will engage in head-to-head battle in an immersive PvP brawler arena. A core goal of Zy Universe is to allow you, the player, to choose how you want to play. Our initial release will be a Battle Royale, and our game style offerings will evolve as Zy Universe matures. It is our intention to provide free-for all, team death-match, and objective-based matches in addition to our debut style. As we continue to share the details of our game in this post, please keep in mind that most of it is about the BR concept. Check out the video for a preview of gameplay. The weapons in Zy Universe will expand on the familiar items found in other run-and-gun Battle Royale games. Using our sci-fi theme to its fullest, we will run the gambit with players’ arsenals – from basic pistols and rifles and melee weapons, to future tech weapons we can’t even describe. On top of this, players will be able to enhance their destructive output through an expansive skill tree, unique consumable items, and map features. What gear you find, and how you choose to spend your skill points, will determine your play style from game to game. Zy Universe is a 2.5D arena shooter that throws you into a match-based, side-scrolling brawl onboard humanity’s last hope for survival, the USS Sovereignty. While the ship is en route, you’ll fight your way through holo-simulated environments as a soldier. Navigate the sprawling maps of the holo-simulator and use the arsenal at your disposal to come out on top. Work with and against other survivors to hone your combat skills so you’re ready for when the Sovereignty reaches its destination. As you play, you’ll gain items and skills that grant buffs for your character, or inflict debuffs on your enemies. Every buff has an opposing debuff, so you may gain a buff like Super-Charged, but if your enemy has Static, they will be able to oppose your advantage for a period of time. In phase one of our release, we will have our Battle Royale map set in ancient ruins. We are attempting to make the map expansive enough to accommodate the full capacity of up to 100 players. Our map will contract as the match goes on to ensure the action keeps coming. As we move into other release phases, we will have additional maps each with unique biomes and themes. In our ancient ruins map, you will be able to choose a starting zone from an introductory overmap. This overmap will show you all available spawn points, and the population density. You will choose and areas based on how your preferred strategy. Maybe you prefer having a minute to get your bearings, or maybe you want to be dropped in the center of the action. As the match begins, you will spawn in or near your chosen zone. Given only a pistol at the start, you will have to provide your own will to survive. To keep the action moving across the map, we will have unique events. These will be announced intermittently throughout the match. Not only will these events keep the battle captivating, but they will provide opportunities for rare loot and plenty of mayhem to boot. Collecting loot is a mainstay of a good battle royale, and Zy Universe is no different in that regard. Loot will spawn randomly, and you will seek out chests, barrels, and downed players in search of it. All loot will be tiered for quality. We will ensure a fair balance, so the best loot doesn’t necessarily equal a win – though the advantages provided will surely make the search worthwhile.